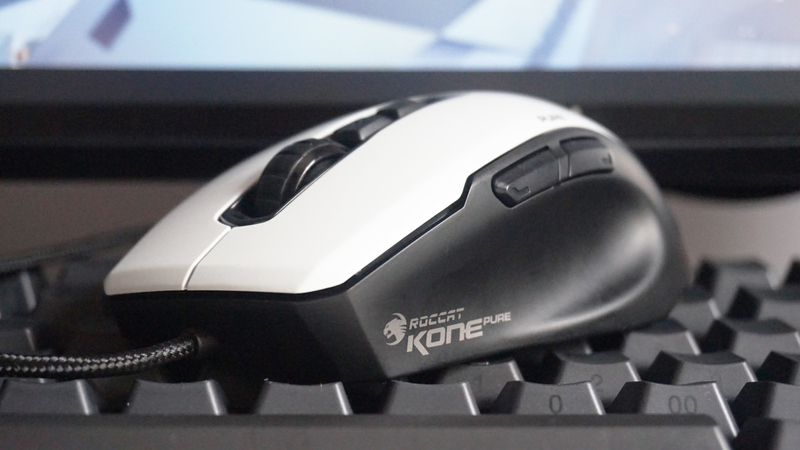 Roccat may be about to be subsumed into the peripherals giant that is Turtle Beach, but for the time being their own gaming accessories are still very much alive and well, including their Kone Pure Owl-Eye gaming mouse, seen here in its recently refreshed white edition. I must say, this little tiddler is quite the sea change after the altogether heftier waistline of the Corsair Ironclaw RGB, but this small £35 / $45 mouse still has a lot to offer over its jumbo-sized competition. Is it best gaming mouse material, though? Here’s wot I think. 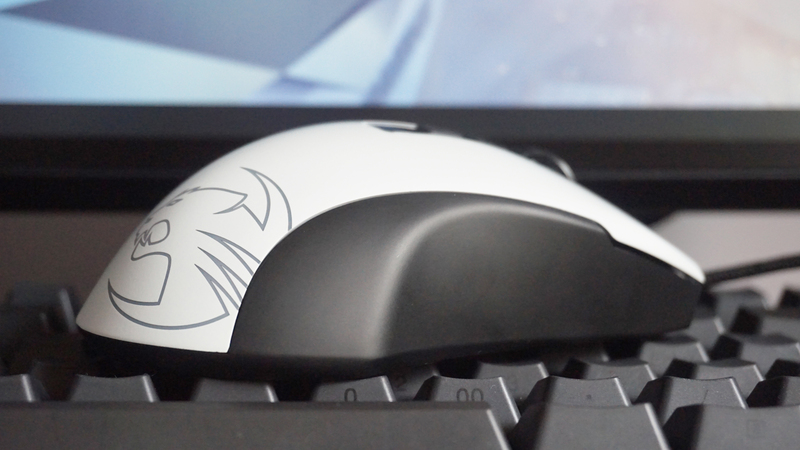 If it weren’t for the giant Roccat lion blazing away in all colours of the rainbow on the Kone Pure’s lower back, you’d almost mistake this Owl Eye model for a regular old office mouse. While the white stripe may not be to everyone’s tastes compared to the regular black model, I’m actually rather fond of it, if only because it looks refreshingly different from all the other black bits on my desk. Weighing in at just 88g, the Kone Pure Owl-Eye is one of the lightest gaming mice around – just 8g heavier than the Logitech G Pro Wireless mouse I use day to day. That’s brilliant for someone with tiny hands like me, and using it to play fast-paced shooters like Doom or more recently The Division 2 felt wonderfully quick and responsive as I moved it around my mouse mat. The scroll wheel, I should add, is also an absolute beaut. There is something about its overall shape, however, that didn’t quite sit right with me. At first I thought it was because it was too flat, but its height of 39mm is only 1mm shorter than Logitech’s G Pro Wireless. So it can’t have been that. Nevertheless, I was constantly shifting my hand around trying to find a comfortable position – a bit like when you accidentally put a jumper on backwards. It fits, sure, but the shape is all wrong. Then I realised that it probably stemmed from its very defined thumb and little finger grooves down the side. These have a very distinct edge to their otherwise smooth hollows, and it’s clear they want your fingers to sit in a very particular position. For me, though, this then meant my second, middle and fourth fingers felt like they were front-loading the mouse and not providing enough weight at the back of my hand to help anchor it down. And given the rest of the mouse’s rather meagre dimensions, I would imagine the problem would only be exasperated for larger-handed individuals. Those who prefer arched claw grips will probably get along better with the compact shape of the Kone Pure Owl-Eye, as adopting this pose felt a bit more natural. However, my fingers are too decrepit to hold that kind of position for long periods of time, so in the end I made do with a sort of slightly lop-sided fingertip grip instead. Design niggles aside, though, the Kone Pure Owl-Eye is surprisingly flexible given its low cost. With a DPI range that extends all the way from 100-12,000 and seven programmable buttons, this already gives you way more options to personalise and customise the mouse to your liking than either the similarly-priced Steelseries Rival 310 or the HyperX Pulsefire FPS. 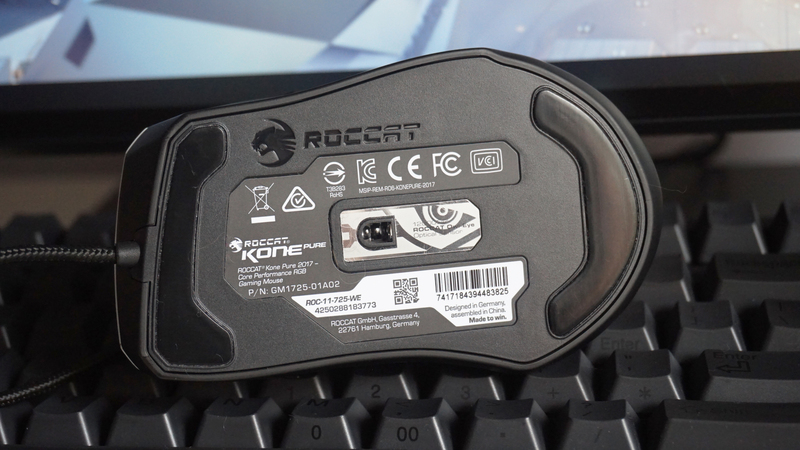 The side buttons are set to forward and back controls by default, while the two below the scroll wheel scroll up and down through the Kone’s five different DPI settings, but all of these (including the scroll wheel and main right and left click buttons) can be assigned a multitude of different functions via Roccat’s Swarm software. What’s more, its Easy-Shift+ function means you can also assign a secondary function to each of those buttons, giving you a total of 17 commands overall. That’s incredibly generous for such a low-cost gaming mouse, although whether you’ll actually ever need that many functions is up for debate. Still, a wide range of options is always welcome in my books, even if Swarm’s interface can be a little cluttered at times. DPI settings can be adjusted in 100 DPI increments, and you can even adjust the vertical scroll and horizontal tilt speed if you so wish. Button functions are also extensive, including dozens of game-specific macros that you can pick and choose from if you don’t fancy recording your own, internet, media and OS shortcuts, as well as the ability to open specific programs, folders and websites. You can also cycle up and down through five different profiles, as well as DPI and sensitivity speeds. The only thing it’s really missing is the option to assign a DPI ‘sniper’ button that you can use to change the DPI on the fly when you’re lining up shots in FPS games, for example. That would have been the icing on the cake, but given the sheer number of other things you can get the Kone Pure Owl-Eye doing, it would be churlish to grumble too much over one lost function. Add in a braided cable and the Roccat Kone Pure Owl-Eye is an absolute steal at its current price, offering high-end features you’ll find on other gaming mice for a fraction of the cost. Personally, its compact shape doesn’t quite do it for me, but if you like your mice small, light and packed full of features, then I reckon it’s still a great budget alternative to our current best gaming mouse, the Corsair Ironclaw RGB. 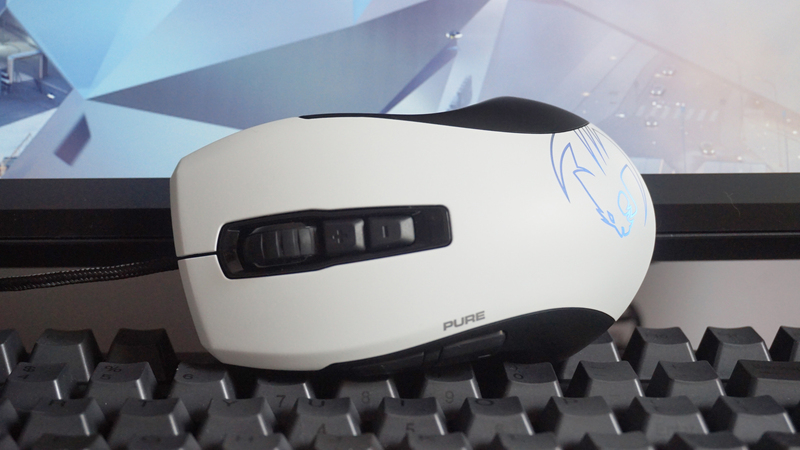 Tagged with feature, Hardware, mice, mouse, Roccat.